FROM CHARLES STRUBLE, HHS '52, THE FOLLOWING INFORMATION REGARDING THEIR 55TH REUNION. THANKS FOR THE HEADS UP CHARLES. TIME: Dinner Dance from 6:30 P.M. to 11:30 P.M. 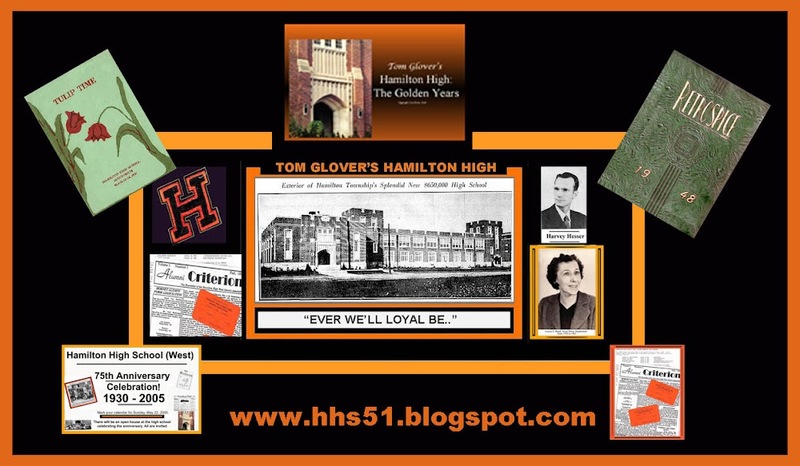 I WILL BE BRINGING A PLEASANT HALF HOUR OR SO OF MY "WHEN MUSIC WAS MUSIC" PROGRAM TO THE 65TH REUNIONS OF BOTH TRENTON HIGH AT THE TRENTON COUNTRY CLUB, AND HAMILTON HIGH AT A NEW RESTAURANT ON ROUTE 33 HERE IN HAMILTON. THESE FOLKS ARE CARD CARRYING MEMBERS OF "THE GREATEST GENERATION", AND I WILL BE BRINGING THE MUSIC OF THE WWII ERA ALONG WITH SONGS FROM THE EARLY 50'S, WHEN MUSIC WAS MUSIC, BEFORE THE ARRIVAL OF THE NOISE WE STILL HEAR TODAY. ONCE AGAIN WE WILL REMEMBER THE SONGS OF PATTI PAGE, PERRY COMO, GLENN MILLER, JO STAFFORD. TO ACCESS THE ARCHIVES FOR PREVIOUS POSTS BACK TO THE YEAR 2005, THE ARCHIVES LISTING IS RIGHT OVER THERE ON THE RIGHT SIDE OF YOUR SCREEN. TO SAVE A POST: RIGHT CLICK ON IT AND CHOOSE "SAVE TARGET AS."